CCTV Input Module - The AXW-AZ converts a standard CCTV camera's signal to a CAT-5e connection. This allows the utilization of a color CCTV camera and a separate audio door station (AX-DM or IE/IF-Series) to be used in place of an AX video door station. A motion detector or other activation device can be connected to the Sensor input to trigger camera activation. 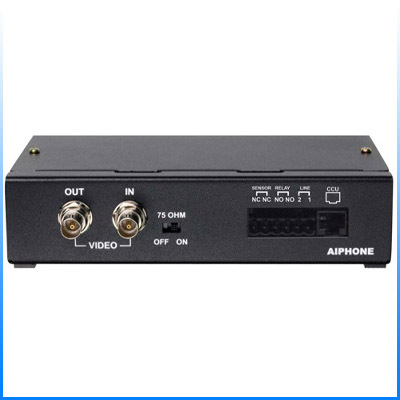 Video output is provided for continual viewing and/or recording via composite pass-through. The unit is equipped with a relay output to trigger an external device, such as a DVR or video switcher whenever the audio and/or video to the AX system is active.